As we serve as a conduit for the healing & spiritual energy of Reiki, it flows into us before blessing the person or object we're 'Reiking.' With the gift of Reiki, we are assured that we will also benefit. I've noticed this in many instances over the years - if I stubbed my toe on the way to offer a session, I'd often feel 'zings' in that toe while I worked, & often couldn't recall WHICH toe was hurt after the appointment. Magic! About 10 years ago, I was taking a series of weekly Soaring Crane Qigong classes, shortly after I smashed my left index finger in my sliding glass door. OUCH! An injury that a Reiki & Massage Therapist dreads. 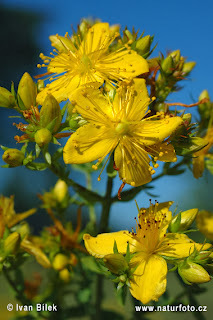 I'd been doing poultices, Self-Reiki, taking Homeopathic Hypericum, (which is especially helpful for healing when nerves are involved), using Hypericum tincture, and hoping that the finger & fingernail would heal well. When I did Reiki, 'zing' I'd feel it in that finger (whether working on myself or offering a bodywork session.) When I began the Qigong classes, 'zing,' I'd feel it in that finger - a little lightening bolt of energy; especially when we learned a sequence that isolated the index & middle finger! Magic. For the next several months, I'd feel those little 'bolts,' fading gradually to a mere tingle, whenever I practiced Soaring Crane or did Reiki. Though the fingernail is a bit crooked, and the finger a bit longer now, it HAS healed beautifully! And occasionally, years later, I'll feel a tiny 'rumble' in the finger - 'Still healing???' ... I guess so! At a party a year or two later, another friend mentioned how her finger (injured the year previous to mine!) 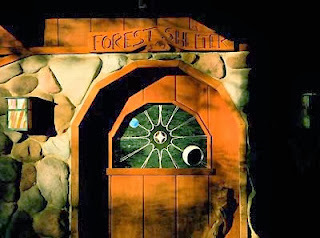 still bothered her at times ... she doesn't 'do' Reiki, & was leary of energy healing. And I was again impressed at how well mine had healed, in a shorter time! Thank you, Reiki! Thank you, Qigong! In addition to the personal blessing of the healing, when clients are injured, I can offer hope that their injuries will also heal, given time & chi! Reiki for the self first. On this day of Thanksgiving in the USA, I am Grateful. The German Philosopher Meister Eckhart (1260 - 1328) wrote: "If the only prayer you ever say in your entire life is Thank You, it will be enough." Today & always, let us live gladly! Around the same time that Takata sought answers for her own health, and Hayashi had opened his Tokyo clinic & was teaching hands on & spiritual healing, Englishman, Edward Bach, had similar questions, a similar quest. He had already begun to notice that different emotional states, worry, anxiety, anger, could affect the patient's health. He dreamed of a different kind of hospital, where patients could learn about themselves, & doctors would look more at the person than the symptoms. As an MD, he worked both as a general practitioner, bacteriologist & pathologist, developing vaccines made using a patient's own intestinal bacteria. Then called to the Harley Street Homeopathic hospital (London), Bach developed 7 Homeopathic 'nosodes' which are still in use. These were based on his observations of personality types, & how health was influenced by these. His work with Homeopathy inspired him, but he still sought a 'lighter touch,' something empowering clients & patients in self treatment. In 1930, Bach left his busy London practice, going to rural Wales, determined to discover & offer a new system of healing. By 1932, Bach had developed his first 12 Flower Essences, advertizing these herbal remedies (flowers placed in a bowl of water in the sunshine, the resulting liquid bottled & preserved with brandy) in the local newspaper, which invoked the ire of the General Medical Council! 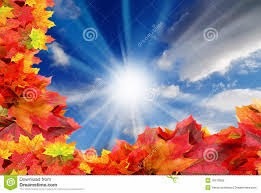 He would devote spring & summers to finding & making the remedies, then in the winter, treat whomever sought his services. At no charge. He often employed hands on healing - even impromptu sessions, suggesting the patient come to his office when convenient ... & later finding that after the brief encounter, their symptoms had abated. After receiving the reprimand from the Medical council, Bach moved to Mt Vernon in Oxfordshire, & developed 19 more remedies. He would identify an emotional state, then suffer that state until he found the plant that would help - then he still needed to make the remedy before his symptoms abated. Sometimes skin would be sloughing off his hands, or he would suffer terrible pain in his joints ... which flower will help? By 1936, at the age of 50, Bach died peacefully at home, November 27th. On the eve of this anniversary, I appreciate the work & life of Edward Bach, humanitarian & healer. This past summer, my friend & fellow Reiki Master Sheila King offered a class on 'Lightweaving' to a group of Reiki Practitioners. Sheila was my small group leader at the Breitenbush Reiki Gathering in the early 90s, & I've appreciated her wise, warm presence and teachings ever since. Sheila writes: "Light Weaving is a method of healing that works primarily with the energetic body. Light Weaving restores missing connections in the energetic body, and also restores connections between the energetic body and the physical body. When missing connections in the energetic body are restored, the related dysfunctional area in the physical body receives more complete information and energy and so can restructure itself properly. This restructuring not only happens in the physical body, it also happens in the related emotional and mental structures. And with this restoration, every pattern related to the dysfunction will heal. Usually with this treatment, people do not have to remember and work through old emotional traumas. With the restoration of the energetic connections they just heal." It has been delightful integrating Lightweaving into my Reiki & Massage practice. Sheila dubs the flow of Reiki & Lightweaving 'Quantum Spiral Healing,' as the two in combination dramatically increase the potential for healing, while offering gentle release. Magic! Some folks 'just drift,' as I often do when receiving energy work. Others receive information or observe issues clearing. I found myself drawn to make several flower essence blends, including a 'garden bouquet' where a number of different flowers float in the water. Campanula - I AM supported in abundance, thrive, prosper & make a resounding SUCCESS of Life! Clematis - Reconnects to physical life, reweaves patterns, grounding with spiritual presence. 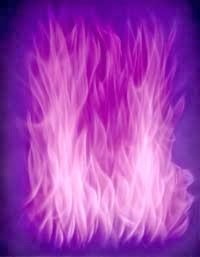 Invite the Violet Transmuting Flame to completly & permanently erase all negativity from Mental, Emotional, Physical & Spiritual bodies. "I AM the cosmic law of forgiveness & Violet Transmuting Flame of all mistakes I have ever made! May they be transformed & transmuted. "I AM the cosmic law of forgiveness & Violet Transmuting Flame for all the mistakes of humankind on earth. May they be transformed & transmuted!" Molly Sheehan, of Green Hope Farm essences also suggests including a sweep of the Violet Flame after doing a Land Clearing! I have done this several times now, & feel an appreciative 'ripple' whenever I do! Molly writes: "The energy process requested most often by the Angels & Elementals after a basic cleansing was the Violet Transmuting Flame. .... the process makes the land feel more harmonious & lighter in vibration." Picture a soothing flame, like a flame in a fireplace, but violet in colour. See it penetrating your very being and world. 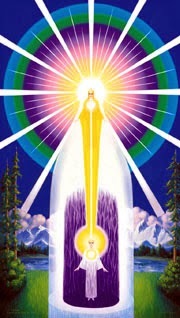 When you call forth the Violet Transmuting Flame, a flame comes from the hands, heart & head of your I AM presence / Christ Self - and as it touches the ground beneath your feet, it bursts into violet flame! You can also use the essences: Comfrey (Pattern repair) Violet & Lavender to help 'seal' the pattern." May you be blessed on your journey! While writing about Reiki yesterday, I looked on u-tube to see if there was anything with our beloved USA Lineage keeper, Phyllis Furomoto, who is Takata's granddaughter. I've had the honor/blessing of meeting Phyllis during Reiki Gatherings at Breitenbush, & played the harp for a meditation she led. I found a delightful interview done in 1912, with another Reiki Master of Japanese descent, Barbara Matsuura. As I listened to the 6 segments (1 hour total) I found that though she has travelled more than I, there are many places Matsuura's & my paths overlap! She studied ballet, & then learned Tai Chi & Qigong. I began with ballet in 1978, & studied Tai Chi concurrent with my massage training, beginning in 1983. I began teaching both Reiki and Tai Chi in the early 90s, & have been working more deeply with Qigong the last decade. Matsuura travelled with her husband, in Japan, she learned Kabuki dance, & later in Germany flower arranging & Japanese classical dance. Following surgery on her thumb after a bicycle accident, she didn't regain full movement. Seeking other treatment, she was introduced to Reiki, & decided to learn. Her classes were held 'once a week, for a month, three hours each class.' She really enjoyed the support of the teacher as she & other students integrated the Reiki energy over the month. She has dedicated her life to healing, & continues to offer sessions, and classes on that schedule today, with offices in Japan, Sedona AZ & California. In the interview, Phyllis & Barbara affirm that 'Every student has within them their own truth,' and each of us can learn from others. Though she was of Japanese descent, they considered her 'American,' & Dr Hayashi was reluctant to accept her as a student. Again, she spoke with Dr Maeda, & pleaded her case. "If I don't have my health, I have nothing!" She was determined to learn! So Dr Maeda took traditional writing materials, a brush, Sumi ink, & wrote Hayashi a letter, stating her sincerity. Frank Arjava Pettier & Tadeo Yamaguchi's book 'The Hayashi Reiki Manual' includes information from the handbook Hayashi gave his students. 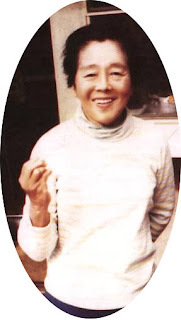 The authors also recount Tadeo's mother, Chiyoko's memories of studying Reiki with Dr Hayashi. The full story of her experiences are told in chapter 2 of that book. Since she studied around the time Mrs Takata was learning Reiki, we can imagine the classes were very similar. Chiyoko's Uncle, Mr Wasaburo Sugano, was the first of their family to study Reiki, beginning in 1928, in Osaka. With the expense of travel & lodging added to the tuition, he asked for the seminars to be brought to their area - Daishoji, district Ishikawa. Her elder sister Katsue had already begun Hayashi's seminars in 1935, while Takata was receiving treatment at the Main branch in Tokyo. Chiyoko had recently graduated from High School, and was eager to learn. Other Branch members, including Chiyoko's older sister Katsue were present as well. The students were asked to sit in the Seiza posture (formal Japanese sitting style, on one's knees) with their eyes closed, sitting up straight on Zabuton (cushions) - of which there were 3 rows with 5-6 cushions in each row. The room was dark, & each student put their palms together in Gassho - prayer position. The attunement ritual, Reiju, was performed, with those giving the attunements placed a hand on their head from behind, then placed their hands around the student's hands. The the room was darkend, & Reiju began, with Hayashi performing the attunemant ritual first, followed by others who held Shihan (teaching) status. Hayashi Sensi chanted poems written by the Meiji emperor during the attunement. After the Reiju was complete, the particapants formed a Reiki Mawashi - sitting in a circle, with each person placing their hands on the person in front, allowing the Reiki to circulate. At this point, the verbal teachings began. Like my Reiki master, Analyse, Dr Hayashi used the image of a muddy stream when explaining the natural clearing process - water may look clear, but there's mud under the surface. Flushing this, or removing the mud on the top, the stream will appear clear, but there will still be mud ... repeating the process, eventually the stream will clear. So it is with the body, with toxins. In the afternoon, the students began to practice doing Reiki, using a rattan bed Reiki Tables, 40 cm high, which allowed the practitioner students to sit on the floor while offering treatments. They were taught to 'listen' for sensations in their hands, & sometimes in their own bodies, alerting them to areas needing attention. Hayashi Sensi encouraged his students to practice steadily to become more sensitive to Byosen, feeling these troubled areas. Other teachings included lessons on making the hands more sensitive, lectures in anatomy and organ function, and giving treatments. The teachings lasted 5 days, & Chiyoko continued to attend monthly seminars, and the 'special ones' when Hayashi returned each Autumn & each spring. Close to the time Mrs Takata finished her training, Chiyoko was granted Shihankaku in the spring of 1939, & Shihan (teaching level) that fall. Her son, Tadao and Frank Petter established Jikiden Reiki seminars to pass on the teachings & ideas from Usui Sensei & Hayashi Sensei. 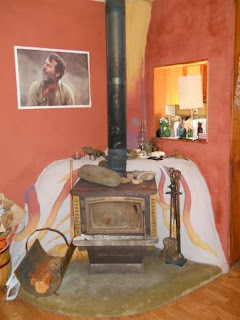 My friend Margo Vance Borland was albe to take one of Petter's West Coast seminars, & shared gleanings from that workshop with several oher Reiki Masters, myself included, about 10 years ago. Jean writes: "The walk through is a very basic concept that I believe most of us do everyday, but never really had a name for. It’s easy to apply to our daily schedules and routines and it’s one that children can completely understand. The walk through is simply going through a room and picking up everything that is out-of-place AND putting it away where it belongs. Simply eh?" This morning I invited my 2 1/2 & almost 3 year old Granddarlings to help me do a 'Walk Through' on the Living room, before Mama & Daddy came home for lunch ... we put away Duplos ("Pick up time! Pick up time!") then went back to the entrance & looked for anything out of place 'oh, oh! Where do these shoes go? ... ooo, lets put these blocks back in the (ride on) train ... how about these books ... ' the 3 year old stayed on task with me, while the 2 1/2 year old got distracted (but at least wasn't pulling more stuff out!!) and we had finished in about 5 minutes .... then we read a couple of stories, before I went back to preparing lunch. While this is a great PHYSICAL practice, while we're at it, we can bless the room with Reiki! If you've been attuned to the symbols, so much the better; but ANYONE can use the power of intention as they're moving through their home. Mrs Takata tells of daily blessing the walls of her new Reiki Clinic & home when she returned to Hawaii, after her time in Japan. use the Mental/Emotional self-treatment to help inspire / make you more aware of what needs addressed, & to help you decide what to keep, what to move on. Bless the room with the symbols, or just smoothing the walls with your 'Reiki Hands' (or simply say a prayer of blessing). Imagine each step you take throughout your home blessing the floor, each touch blessing the items, the walls, the surfaces. As you sweep or vacuum, imagine any disharmony, discouragement, sadness etc being removed from the room. Do a final 'Walk Through' after you've done the physical straightening/ clearing, & bless the whole space. Just for today, bless your home & office as you 'Walk Through,' clear & cleanse. When Takata went to Japan & entered the hospital, it was the Dietician who began introducing her to Reiki, through the blessed food & water that she was served. As she gained stength for the proposed surgery, they told her to Consider the Hospital as "a Fancy Resort Hotel or spa." Reiki, Etheric, & Lightwork teachers all suggest BLESSING the fluids we drink and food we eat. An African teacher suggests beaming 'rainbows into your water.' Here is a fun post on making your own 'spa water' by marinating fruits, flowers & herbs in your water! 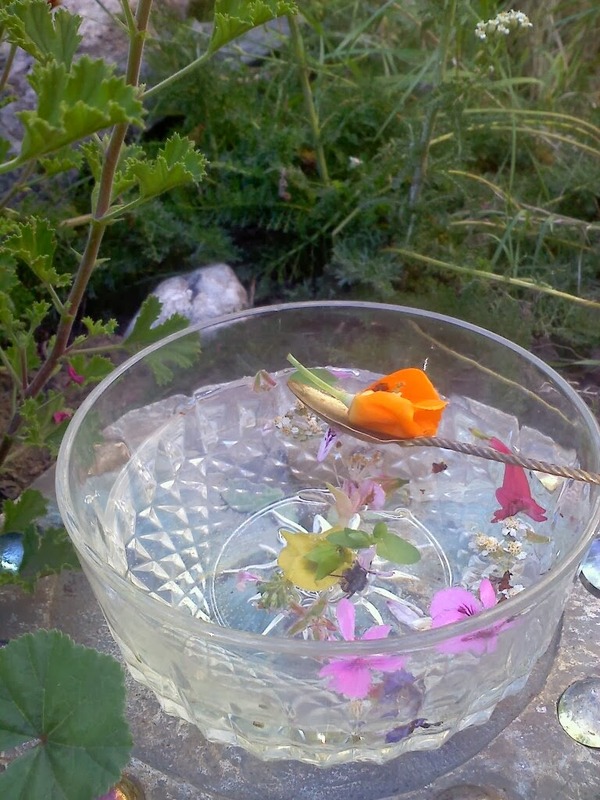 My dear harper & healer friend Jewel often gathers FLOWERS (edible & OG) & herbs, & keeps a supply of pretty glass pitchers on hand for gatherings. The first I attended, she sent me out to the garden with a basket to gather herbs & flowers, which we rinsed, placed in the pitchers, then added lemon slices & filtered water! Beautiful. And tasty! A few drops of Flower Essences are another way to enhance your Spa Water. 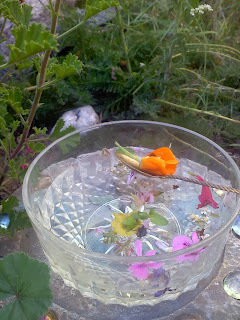 So if you struggle to drink enough water - try some 'spa water' with flowers & herbs from your own (unsprayed) yard! Remember to stick to plants you KNOW - here's a nice chart of edible flowers, with some tips on use & cautions. And beam Rainbows into each glass - Viola! Spa Water! As a child, I always LOVED it when my mama told stories of 'the Olden Days,' when she was growing up. Many of the stories of Reiki that have come down to us were told by the the Dynamic woman who brought Reiki to the West in 1938, Hawayo Takata. I've always loved the stories she told of her own experiences. Born Christmas Day, 1900 in Hanamaula, Kaui, Hawaii; Hawayo Kawamura's mother had big dreams for her tiny daughter, so named her after the Big Island of Hawaii. As a young girl, Hawayo quickly moved from field work to working in a Store, & March 10, 1917, she married Saichi Takata. They had two daughter, and remained in Hawaii, while the Kawamuras returned to Japan. By 1930, she had been widowed, & in 1935, her sister died. Her own health had deteriorated, both from continuing to work hard, & from grief. She decided to take the news of her sister's death to her parents directly, & visited them in Japan to do so. After the services were finished, Hawayo checked into the local hospital, with 'stomach pains,' & was diagnosed with a uterine tumor, gall stones, appendicitis; and had suffered with asthma since childhood. Because of the asthma, she was told to 'think of the hospital as a fancy resort hotel, & rest up!' before surgery was attempted. And so she did. Now the head surgeon's sister was the hospital dietician, & several years before Mrs. Takata's admission to the hospital, the Dietician had passed out, & been in a coma. Their family was related to the Hayashis, so when Dr Hayashi heard of her illness, he'd treated her with Reiki, & she'd made a full recovery. So daily, the surgeon's sister, the dietician, would prepare nourishing food for Mrs Takata, & bless it with Reiki. Daily, she wondered if she should try to tell Mrs Takata about Reiki ... but she was a foreigner ... what would she think? GOT OFF THE OPERATING TABLE!! Can you IMAGINE? 1935. Japan. A woman ... got of the operating table! "I'll get my sister, she's the dietician here ..."
So the problem was explained, & the Dietician offered to take Hawayo Takata to Dr Hayashi's Reiki clinic. She explained about her own coma, & how Reiki had helped. She explained that it could take months, but it was a powerful healing technique ... did she want to try that? YES, Why, YES, she DID! Over her appendix, Over her belly ... how did they KNOW? They hadn't brought her charts along ... And their hands! They had such HOT hands!! The next day when the dietician brought her for the second treatment at Hayashi's clinic, Mrs Takata was ready! After the treatment began, she slapped the practitioner's sleeves (long traditional kimono sleeves) to see if they were attached to battery wires! And WORSE - she began asking questions! Mr Hayashi came out of his office, to see what the fuss was about - & laughed along with the practitioners at the silly Western Woman! learning how to do this wonderful Reiki! Chujiro Hayashi was born in 1879 or '80 in Tokyo. Like Usui, he was married, with two children. He served in the Japanese Navy, & in 1918, became commander of the defence station of Port Owinato. Hayashi trained in Western and Chinese medicine, and his traditional Japanese spiritual practices included Soto Zen & Shinto. His student Mrs Yamaguchi relayed he was also Christian (Methodist). This would not be uncommon in Japan, even now. Hayashi retired from the Navy, & in 1925, became a student of Mikeo Usui, 10 months before Usui's death. Several other Naval officers joined the school not long afterward, & continued his healing/spiritual work under the title 'Usui Reiki Ryoho Gakkai. In 1931, Hayashi began developing his own clinic & school for healing, which became known as Hayashi Reiki Kenkyu Kai - Hayashi Spiritual Energy Research Society. His clinic had a treatment room where eight clients could be treated, with two practitioners at each futon. His wife Chei, also trained in Reiki, served as hostess and receptionist for the clinic. Students volunteered in the clinic, generally doing treatment for 8 hours a week. After three months, they could proceed to learn the second level, Okuden; after 9 months, they could help run the clinic. After two years, they could attain the teaching level, Shinpiden, & learn to teach and pass attunments. 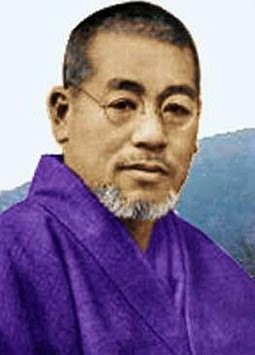 Hayashi changed the format for teaching and attunments, and included mantras & symbols in the initiation process, (Usui did not) His teachings have strongly influenced our Western Practice of Reiki. Hayashi wrote a guide Ryoho Shishin, & may have written the guide used by Usui & the healing society, since he was a doctor & familiar with anatomy & disease. He also offered a series of hand positions, treating organs & acupuncture meridians. By 1938, Chujiro Hayashi wrote that he had trained 13 Reiki Masters. By this time, other of Usui's Shinpiden had also begun Reiki schools, & there were about 40 dojo spread throughout Japan. In 1940, both Chei Hayashi & Takata report that Chujiro took his own life, having dedicated his life to healing, he was reluctant to be called back to Military service. Chei continued to run the clinic in Japan, becoming the second president of Hayashi Reiki Kenkyu Kai. When Takata brought Reiki to Japan in the mid-late 1930s, she told many stories about the beginnings of Reiki as we know it. Over the years, others have visited Japan & brought forward more information. Our modern practice of Reiki has been handed down from Mikeo Usui, who was born Aug 15, 1865, into a Samurai family in Teniai (now called Miyama cho) in the Gifu Prefecture in Japan. Little is known of his early life, but as a child of the privileged class, he likely began his studies with the Chinese & Japanese classics, learned martial arts, music, read & wrote poetry. Born into a Buddhist family, Mikeo Usui became a lay Tendai priest, who married (Saduko Suzuki) and had two children. It seems he introduced his teachings, Usui do, as a means toward enlightenment, with the healing that took place for students 'a wonderful side effect.' His inclusion of attunement or reiju, which facilitated spiritual alignment. 'It seems that all students of Mikao Usui recieverd reiju & the five precepts. ... There does not seem to be a disinction between clients & students' (Reiki Sourcebook, p 58/59) He also gave students mantras and meditations. Usui began teaching in about 1915, his wife's cousin Suzuki san was one of the early students. In 1922, according to the Memorial stone errected in 1927, Usui 'Climbed kurama yama (12 kilometers N of the Koyoto Imperial Palace) and after 21 days of severe discipline without eating, he suddenly felt One Great Reiki over his head and attained enlightenment and he obtained Reiki Ryoho.' The Usui Reiki Ryoho Gakkai society was set up one month after his experience on kurama yama. The teachings became more formalized, symbols (Yantras) were added to the mantras, & hand positions taught to students who found it harder to work intuitively. 'He was often invited to travel throughout Japan treating people & teaching students. Mikao Usui had over 2000 students in total, about 60-70 okuden (2nd Degree) students & 21 teacher students who reached shinpiden. (information from the memorial stone & from Hyakuten Inamoto of the Reiki society - p 64 in Reiki Sourcebook) Reiki Council UK offers an account of the history, with teacher student/Master lists for Usui, Hayashi & Takata. Many of the students who studied with Usui were nuns & monks, and in 2005, 12 were still alive (some over 100 years old) The Reiki Sourcebook includes a lineage chart, with 13 of the senior students. In the year before his death, several Naval officers also studied with Usui. Usui died of a stroke on March 9, 1926 in Fukuyama, & the memorial stone was erected the following year, at the Pure Land Buddhist Saihoji Temple in Tokyo. May all beings be well. May all beings be Happy. May all beings know peace. We talked a few minutes, she was VERY reluctant to stay, but generally followed her intuition... so I suggested she could remain for the general information (history, Reiki healing stories) portion, but when it was time for the initiation, she would need to decide whether she was leaving or staying. When the time for the practical teachings & initiation arrived, she agreed to stay, & we proceeded to initiation. The building is topped with a large skylight, & rain was falling. She told us that someone had told 'Read' that lifetime, but she hadn't had memories till then; and during the initiation, with the rain striking the roof, she'd 'felt' the stones hitting the side of her body! The lesson had been that we needed to keep our Vibration high, & not try to convince others of the value, but lead by example. During MANY classes since that one, a student has commented 'we'd better keep this to ourselves, people have gotten BURNED for healing!' ... & I tell A's story, with the reminder that it's important to to stay in our power, rather than moving into fear. To keep our own vibration high, as we share Reiki healing and teachings! Do you belong to the 'Can't Miss a Thing!!' Club? I used to. I'd often get sad or mad if I missed an event - especially if I found out AFTER the fact! Over the years, I've found it's better - for me - to prioritize, & only do what feels important, feeds my energy, delights me! 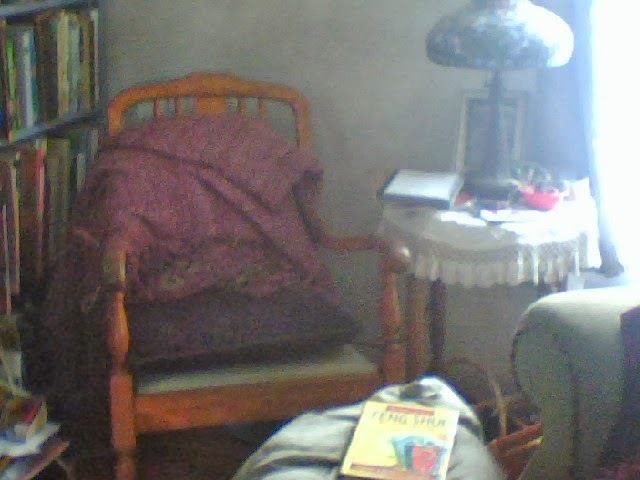 Family time generally comes first; I love dance opportunities, but at the end of the week, may prefer to simply tuck in at home with a book. When I miss something, I often find someone tells me about it, & I enjoy the event vicariously! Just for today, find delight in all you do & are. I utilized the Land Tune Up for several years, then noticed that Molly Sheehan suggests using the Violet Transmuting Flame as a 'cap' for the process! I already included the Violet Flame at portals (sidewalk, driveway), so it was sweet to add it to the process itself. & head of your 'I AM' presence, and as it touches the earth beneath your feet, it bursts into flame. Picture it like the flame in a fireplace, only violet/purple in colour, joyous, comforting, relaxing, gentle & healing. 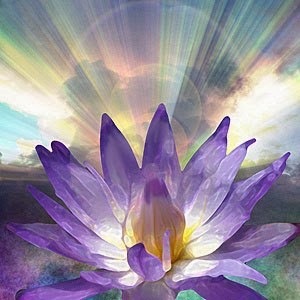 Imagine the Violet flame rising beneath your feet, gently filling you, moving through every cell of your body. Draw the flame into your heart, & let it flow throughout your body, mind, energy system. Imagine it flowing through your physical, mental, emotional & spiritual bodies. As it clears all stale energy, incomplete reactions & stresses, feel love & forgiveness pouring from your heart, to all creation. 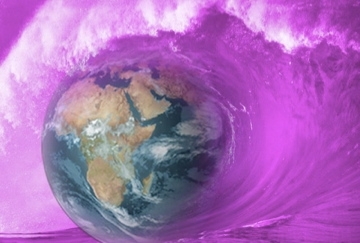 Here's a Violet Flame guided meditation. In her article 'Violet Transmuting Flame,' Molly Sheehan writes "When I started to do energy processes on my land, the energy process most requested by the Angels & elementals, after a basic cleansing, was the Violet Transmuting Flame. I noticed right away the process made the land feel more harmonious & lighter in its vibration.... If we go out & walk around the land in a bad mood or full of worries, the land absorbs this negativity until we consciously transmute it. You can imagine how much negative energy is being held by most pieces of land. Violent weather is Nature's way to release and transmute this human negativity. The Violet Flame can do it much more gently. ... We must now free the land of the negativity it has held for us, & take over the transmutation of our own negativity. The Violet Transmuting Flame is an excellent tool for this transmutation process. It can clean the physical dimension of land including the atmosphere over land of all mental & emotional negativity. .... The Violet Transmuting Flame will clear the etheric body of land so only constructive memories remain recorded. Is it any wonder nature kept asking me to use this amazing tool? If you work with this tool, you will feel the energy improve on your land and so will your friends, the Angels & elementals." To include the Violet Transmuting Flame in your Land Tune-Up, simply finish as usual, with the invocation to CLEANSE, CLEAR, RE-BALANCE & ILLUMINATE the land you are tuning, imagine the Violet Transmuting Flame coming into you (as above), touching the earth beneath your feet, rippling out to cover the piece of land you are blessing. Invite the VTF to 'Blaze, Blaze, Blaze,' & transmute any stale, negative, unnecessary emotions and energy being held in the land & atmosphere. I imagine a briar rose hedge surrounding my property, with 'portals' or doorways at the entrances: driveway, sidewalk, that are Violet to transmute my energy as I leave & enter, & the energy of any guests. I painted my front door purple a couple of years ago, & I LOVE it! Flower essences from any purple flower, including Comfrey, purple clematis, Violet, penstemon, foxglove, etc. can be used in harmony with this clearing, to assist in the transmutation! I've 'sent' Reiki to people & situations over the years, individually, in Reiki Circles, on prayer chains, etc. The author noted that he decorated a small box (his is 3" x 2.5" x 2.5") of natural materials, & puts slips of paper with requests for distant healing, his own blessings for past & future, & 'anything else that needs Reiki energy.' He charges the slips with Reiki (sometimes drawing the symbols) before placing them in the box. 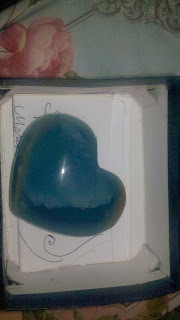 I put this blue crystal heart on top of the requests in my Reiki box. In December, I plan to do a Zen funeral with the papers in the box, & begin anew. Do you have a favorite way to send Reiki/ prayer healing? In addition to our work on each other, we can use Reiki to clear & bless land, as suggested in my last post. Here's a process you can adapt for use at home - Reiki enhances the clearing, but this can be done by ANYONE! Several years ago, my friend Molly Sheehan of Green Hope Farm Essences shared this wonderful land clearing practice, given by the guides of her land. She gardens co-creatively, & has a very sweet 'anyone can do this' attitude. Molly graciously gave me permission to share this, saying that the more people doing this or similar processes the better! Machaelle Wright of Perelandra teaches similar processes in her Garden Workbooks, & offers her own powerful essences.I work with both of their processes & essences, as well as my own. 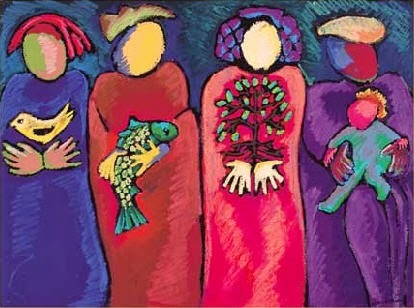 Molly comments that the guides & devas delight in being asked to help us, "A group of spiritual entities connected with Nature do the actual energy cleansing but this group cannot do this work unless a human asks them to do it. It is one of our vital roles in the co-creation & maintenance of earth. If a human doesn't ask for energy cleansing for a piece of land & this land is holding a lot of negativity, spirit's only options for removing this negativity are extreme weather." * I have a slip of paper on the fridge with a quick summary of the process - & often just step outside & ask that the Angels, Masters, Elemntals & Devas 'CLEANSE, CLEAR, RE-BALANCE & ILLUMINATE' my land! ** Imagine the boundaries of the land you wish to clear (you may want to have a map of your property, if it's larger, & may be guided to clear it in sections. If you're in an apt., clear your own space, imagining the grounding cord of the apt going into the earth below you, & clear the land surrounding the apt. Pay attention to guidance on what suites your circumstances. Find a quiet & comfortable place to center yourself. In the beginning, you'll want to be in the garden you're clearing. The Elementals of the land. These are the beings who bring land into form & then hold it there so we can live in a physical world. Gnomes for the Earth element, Undine with water, Sylphs work with air, & Salamanders with fire. Our Sun, Helios & Vesta. After you call in this group, ask them to CLEANSE, CLEAR, RE-BALANCE & ILLUMINATE the land you are clearing. 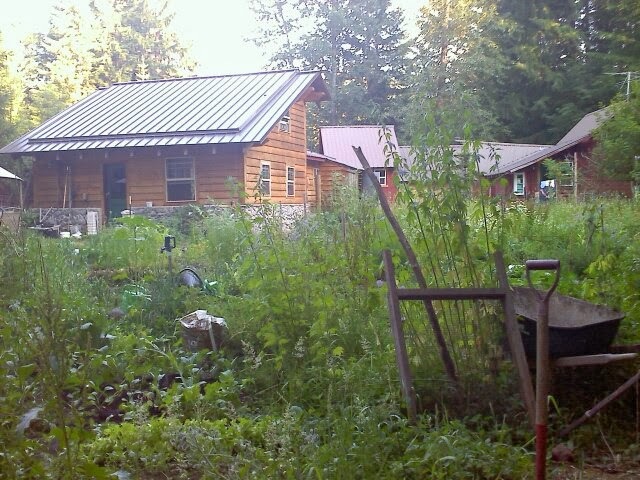 You can visualize all the negativity being removed from the land both below & above the ground. You can visualize yourself or an angel holding a sword (Michael/Michaella) cutting all the negativity free, perhaps spinning in a circle holding the sword out; or you can imagine a big gyroscope whirling & cleansing. The image only needs to work for you. If visualization isn't possible, it's OK. The land will still be cleansed because you have asked to have it done. Close the session with a thanks to everyone involved. There are many ways of 'sending' Reiki over distance of space & time. This practice has been done over the centuries in many traditions. A few years before I learned Reiki, my friend Candy G mentioned that her Cherokee Grandmother was a 'Prayer healer;' whenever she thought of someone, she immediately sent a blessing to/for them. People would often stop them on the street, to thank Grandmother for her prayers! She didn't need to know what was wrong, simply that prayers were needed! I remember thinking "I want to do that, too!" ... and focusing on that, when I would think of it. Years before, a friend raised Catholic & I heard sirens, & she immediately sent blessings, as the Nuns had taught her. Again, I had been inspired by this, & incorporated it into my practices. When I learned 2nd Degree Reiki, I had a new tool/vehicle for doing this. "When I want to send prayers to somewhere in the world, I use Google Earth to "fly" over the location . . . and then use that image to focus my prayers. It really helps! "For example, the typhoon in the Philippines is flattening the land and harming the people . 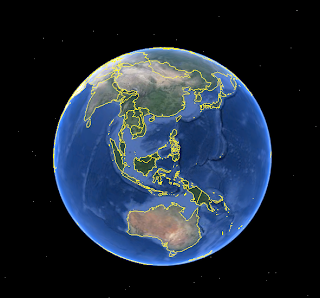 . . so here is the Philippines in the center of the globe. Then I zoom even closer...and start pouring prayers and love in to the area." Let us all be Prayer Healers! There are many ways to utilize Reiki for personal healing & clearing. One of the simplest is to use your breath plus visualization. Can you do this even if you haven't been initiated into Reiki? YES! Intention & visualization are powerful tools. Just imagine yourself filling with love, peace, calm, health. Take a moment to get comfortable - if you wish, set the scene! Light a candle, ring a bell, sit on a cushion or lie down. Imagine yourself in a beautiful spot in nature, a high mountain stream, by the ocean, someplace the air is pure & clear. Imagine that you are breathing in this pure clear air. Breathe in through your nose, exhale can be either through nose or mouth. You may find yourself sighing at times - that's a wonderful release! Slowly inhale into the crown of your head, & feel the breath filling your head. Gently exhale, releasing worry, anxious thoughts, tension. Wait till your body 'nudges' you to inhale again. Slowly inhale, feeling the breath filling your head & down into your chest, into your heart. Pause ... & exhale, releasing tension, pain, heartache. Relax, letting all worries, tension, pain, anxiety, doubt float away. You may wish to place your Reiki hands on your heart & belly, as you invite this clear, beautiful breath to fill you, bringing balance. With the next several breaths, allow your whole body to fill with this fresh, new, blessed energy, gently observing obstructions, places that offer resistance, filling them with energy, & allowing the old to drift away. Now, breath into your heart, and feel energy flowing to the palms of your hands & soles of your feet. Feel that Reiki light pouring through your entire body. Take another deep breath into your heart, & with your exhale, 'beam' the love/calm/peace you're feeling out to the room around you. With the next heart breaths, beam to your city, your friends & family, to the world. Bask in the breath for as long as you wish - it's QUITE OK if you drift off for a bit! When you feel ready, slowly open your eyes & take in the room around you. Bring your awareness to your feet, wiggle your toes. You may wish to pat down your arms & legs, as you come back into awareness of your body. Enjoy the beauty of your day! When Takata, who brought Reiki to the West in the late 30s, was awaiting surgery, (which she avoided!) then healing from her stomach pains (Uterine tumor, gall stones, appendicitis) the Dr & Dietician told her to 'treat the hospital like a fancy resort hotel;' to rest up & enjoy the wholesome food. And after consulting with the surgeon, she was able to talk with the dietician, & found out that, indeed, there WERE other options, there in Japan! Blessing food & drink with Reiki is simple, and profound! Many traditions suggest a prayer of thanks, of appreciation for the food & those who prepared it. Teachers of every form of healing that I've studied say the same - use the energy we teach to bless what you eat, bless what you drink. 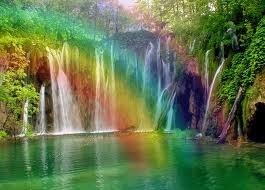 One African teacher suggested holding your hand above water (or other liquid) & beaming RAINBOWS into it! Just for today, take a moment to express your gratitude for all you eat & drink, & dedicate it to the best use by your body! A couple of weeks after meeting our Reiki Master, another student & I arrived at her home for our First Degree Reiki class. One of Analyse's Mastery students joined us as well, to participate & observe. We alternated between teachings, sharing stories & experiences, initiations & learning to give (& receive) treatments. Analyse described the initiations as 'clearing the pipes' for the energy to flow through us, unimpeded. 'Think of the water pipes in two houses, a 'city house' & a summer home. If you turn on the faucet at home, the water runs clearly, while those in a place that's rarely used my sputter a bit, & run a bit cloudy. BOTH pipes have corrosion, but you don't observe that as much in the pipes that are used regularly. I had certainly experienced that - sometimes I 'felt' more in my hands than others, and I had sensed that there was 'more' I could do, if only I knew WHAT it was! With the initiations, & the ensuing time for practice, I felt the energy more consistently! Analyse gave us suggestions on using Reiki, including self-Reiki treatments. She warned us that we might experience a 'healing crisis,' after the initiation: physical aches, emotions might flow, etc & to observe them, rather than get caught up in them! I found myself crying several times over the next few days - as I read a book I'd picked up on the way home which triggered a comment a HS teacher made! I remember realizing that I wasn't really sad, rather it was the release my teacher suggested might occur. 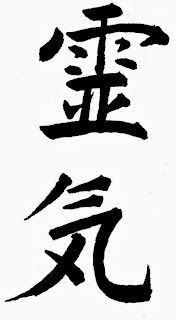 The word 'Reiki' is used in the West to denote a healing system. The founder of our Modern Reiki System, Mikao Usui didn't use this term, his teachings were more commonly called 'Usui Do' (the Way of Usui) and the healings 'Usui teate' or Usui's form of hands-on healing. 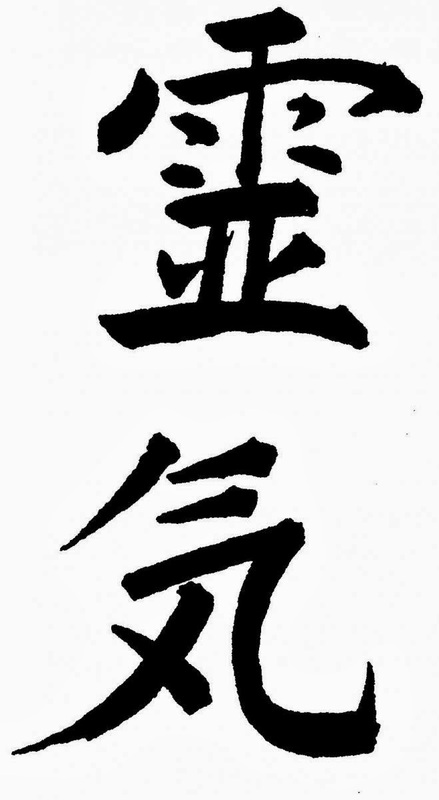 Later, the word Reiki was added or substituted, to signify the system utilized spiritual energy. I came to Reiki training by 'happenstance,' when I attended a talk on the asteroid Chiron, the 'wounded healer' & the speaker mentioned how Chiron oversaw healing initiations, & that she would offer a Reiki class in a few weeks. "As an archetype, Chiron embodies key a lesson for today: how to link the daily concerns of life (paying the rent, washing the laundry, getting around in the world, and so forth) with the more profound spiritual realities — and then sharing what we learn with others. Chiron thus symbolizes the ability to establish a working bridge between the realm of the earth and the realm of Spirit." I was intrigued, & signed up for the class on the spot. I'd long realized there was 'more we could do' with our hands, without personal effort; but hadn't been sure how to tap it consistently. The class answered many questions, & left me hungry for more, when the time was ripe! 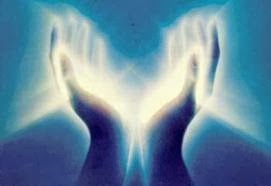 Some students who are drawn to Reiki have been experiencing increased energy, perhaps having 'hot hands,' energy surges, feeling other's pain or discomfort in their own body (kinethetically sensitive!) dreams of healing. Often it's helpful to receive a session or two before being initiated, to acustom the person to the energy before attunment. Have you considered the role Reiki might play in your life? In the mid 90s, I attended a Flower Essence workshop with Australian ND, 5th generation healer & Essence Practitioner Ian White. He gave a lovely presentation on the Australian Essence Pharmacy he developed, & at one point, invited us to do what he called a "Zen Funeral." We each wrote quickly about things we wished to release, and then burned the list in the fireplace at the Retreat Center. I immediately saw the application using Reiki & the Principles! What are your Worries? What Angers you? Are there some hard lessons (recent or past) you struggle with? Teachers/ elders/ friends you're out of balance with? Does something about your job bother you? Relationship? Finances? Put them on paper. Write quickly, write passionately, draw, cover the paper - you choose! Hold your hands over the paper & bless it with Reiki (if you know the symbols, draw any that seem appropriate) When you've finished, release the paper - and the issues - into the flame! Watch the paper burn, & release the issues into greater hands. I've used this practice during initiations, & suggest students practice their own Zen Funerals periodically, as they feel the need. If we're 'stuck' on an issue, Abraham suggests we 'Never Talk about that Again!' This is WONDERFUL completion for the Zen Funeral - you have released the issues. Now - move on! The 5th principle invites us to show Gratitude to every living thing, to live from that place of gratitude. Living in Oregon, surrounded by fall beauty, it is easy to be grateful! 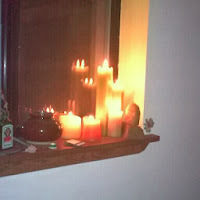 I often invite my Reiki students to spend several minutes before bed, and again when they arise, 'counting blessings.' You may wish to do this in a journal, as writing empowers the words. As we move toward Thanksgiving in the US, many people choose to think of things they are thankful for each day of the month - what a lovely practice! Just for today, be kind to those around you, & show Gratitude! This Principle is often translated 'Do your Living Honestly' - I really like the original - with APPRECIATION, do work! Right livelyhood ... daily focus on being/doing/ exampling the best that you can possibly be in whatever you are doing! In a talk on finding yourself in a negative situation at work, Abraham suggests: "In fact, do your best to be unaware of the disharmony, because in actually being unaware of the disharmony, there will be no active Vibration of it present within you, and the Law of Attraction will then leave you out of any discordant rondevous. "It may sound odd, but the fastest way to get to a new-and-improved situation is to make peace with your current situation. By making lists of the most positive aspects you can find about your current situation, you then release your resistance to the improvements that are waiting for you." In her stories about Reiki, Takata shared that as she began teaching Reiki (in the late 30s), she wanted to initiate friends & family at no charge, but was discouraged from doing so by her teacher, Hayashi. She decided to go ahead with several initiations, but quickly found that her students (neighbors) didn't trust their own abilities, and wanted HER to do the healings! How do you relate to this principle? Do you love what you do, in work & in life? Do you bring a sense of appreciation wherever you go? Do you thank those who serve you, & share smiles gladly?